Canberra is the capital of Australia and the most prominent city in the Australian Capital Territory (ACT), home to Australia's Parliament. Designed and built in the early 20th century, Canberra is situated between both Sydney and Melbourne, and features a striking and rather organised selection of modern architecture, fantastic tourist attractions, memorials and Australian monuments, as well as an enormous number of museums. 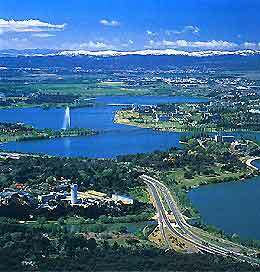 In 1963, the Molonglo River was dammed to create a vast artificial lake in the centre of Canberra - Lake Burley Griffin, which was named after the American architect responsible for the overall design of the city (Walter Burley Griffin), and immediately transformed the landscape. Northbourne Avenue lies on the northern side of the lake, where it is home to the Canberra tourism centre and its useful tourist information, and connects the city centre, while the main shopping districts are situated to the east. 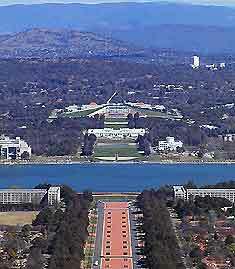 The Commonwealth Avenue crosses the lake and heads in a southerly direction, reaching the Capital Circle and the Parliament House. Accommodation in the city centre itself is far from plentiful and many tourists look for hotels in northerly suburbs, such as Ainslie, Downer and O'Connor. Further hotels await patronage around the Capital Hill area, within the districts of Barton and Kingston. The Manuka district and the nearby town of Queanbeyan also present additional lodging options. Historic tourist attractions for visitors to Canberra include the Captain Cook Memorial Water Jet - on Lake Burley, with an enormous jet of water reaching up to a staggering 150 metres / 490 feet high; the New Parliament House - the seat of local government and also one of Canberra's most recognisable landmarks; the Old Parliament House - home to the Australian Federal Parliament from 1927; the Telstra Tower - a tall tower offering superb panoramic views of the cityscape, with a popular revolving restaurant; St. Christopher's Cathedral - a striking Roman Catholic cathedral built in the 1930s; the National Archives of Australia - containing a vast collection of Australian heritage, with exceptional research facilities; the National Library of Australia - to the south of Canberra city centre, housing literally millions of books and important documents; and the Royal Australian Mint - with historic displays about Australian currency production over the years. Other popular attractions for tourists and visitors to Canberra and the Australian Capital Territory (ACT) include Lake Burley Griffin - a spectacular beauty spot, created by the Scrivener Dam; Mount Ainslie - across from the Parliament House, with great panoramas of the surrounding coastline; the National Zoo and Aquarium - the perfect attraction for children and families, with sharks, an underwater tunnel, many indigenous animals and more exotic creatures; the Australian National Botanic Gardens - in Canberra city centre, with landscaped gardens and important collections of Australian plants; and the Commonwealth Park - a large, scenic public parkland suitable for walking and cycling. 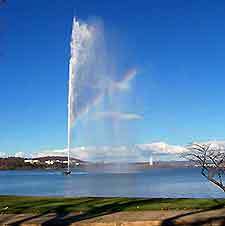 More information about Canberra Tourist Attractions and Canberra Landmarks. Canberra also has a number of excellent museums and these include the National Museum of Australia - in the heart of the city centre, containing impressive natural history displays; the National Science and Technology Museum (Questacon) - a unique experience filled with technological wonders; the Canberra Museum and Gallery - home to a wealth of important paintings and sculptures; the Australian War Memorial Museum - a famous monument with large displays, galleries, many historic exhibits, pictures, dioramas, weaponry collections and a reflection pool; the National Gallery of Australia - with a permanent collection of traditional and contemporary paintings; and the National Portrait Gallery - on the south side of central Canberra, with many outstanding paintings of famous Australians. More information about Canberra Museums and Canberra Art Galleries. Nearby central Canberra there are a huge number of major tourist attractions, including national parks, small villages, towns and cities, such as Binalong, Boorowa, Bowning, Bundanoon, Bungendore, the Bywong Town Gold Mining Village, Cowra, Crookwell, Goulburn, Huskisson, Kangaroo Valley, Murrumbateman, Queanbeyan, Taralga and Yass. Popular excursions from Canberra include trips to Australia's famous city of Sydney, which car be reached by car in around three hours, and the Snowy Mountains - a popular ski resort. Canberra is overflowing with historic vineyards, wineries and breweries, and many of the best wines in the Australia Capital Territory (ACT) are produced in the nearby Murrumbateman wine region. Wines from the Canberra region are highly regarded throughout Australia and the world. Nearby areas of Ballandean, Bungendore, Lyneham, Tuggeranong and Wallaroo are amongst other important wine regions close by, producing world-class wines. 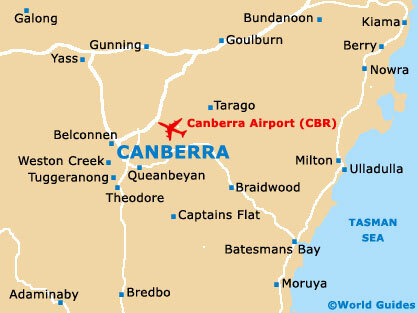 The capital city of Canberra contains two of Australia's most prominent universities, the University of Canberra and the Australian National University (ANU). These institutions have vast campuses, outstanding facilities and prestigious reputations. Both of these universities offer interesting guided tours of the overall complex and buildings. More information about Canberra Universities. Canberra generally enjoys an extremely high average of more than seven hours of sunshine every day of the year, with around nine hours of sunny weather during the summer months of December, January and February. The hot and dry weather, plentiful sunshine and generally mild climate all combine to make Canberra one of Australia's most popular cities, attracting visitors to the Australian Capital Territory (ACT) from all over the world.